One of our members sent me an email with a question and while replying I thought this may well be a problem that others have so I should blog the answer. This was the question. I have Lightroom 2, but have not really got my head around to understanding it – but then I don’t spend much time trying I suppose! The one thing that I find frustrating, is that images seem to “get lost” – if I try to open some of my older images, it says “file missing or offline” – I don’t know how to get them back? Can you please help me if you can? 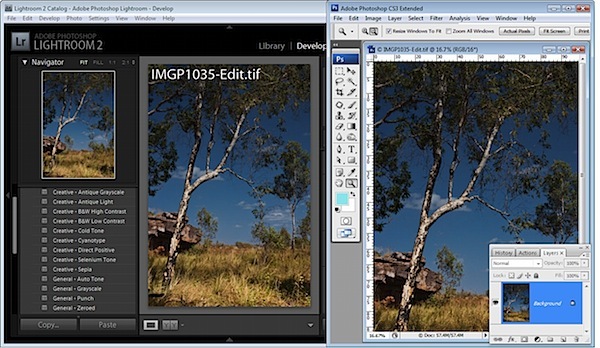 Lightroom is as much an image management system as it is an image processor. It uses a database to keep track of your images and the non-destructive changes it makes to them. There are several options for importing images, some of which reference an image where it is on your disk and others that copy it from a memory card to some place on your disk and then reference it from there. They key here is that Lightroom doesn’t have the actual image in its database, but a reference to it at some location on disk. I will talk only in terms of Lightroom on Windows below but I believe the Lightroom functionality will be the same on the Mac and references to Windows Explorer can be substituted with Finder there. Let’s say you have an image portrait01.jpg in a folder C:\Pictures\Portraits (no significance to the names, just chosen for demonstration) and import it to Lightroom. A record is made in the database, including the location of the file on disk (C:\Pictures\Portraits\portrait01.jpg). If you later move the image using Lightroom’s own management features, it knows where the image moved to and can update the reference to the disk location accordingly. If however, you were to use the image outside of Lightroom using Windows Explorer or some other tool, Lightroom will not know this. 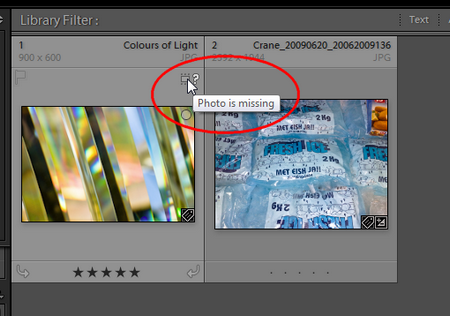 When next you use Lightroom it will look at the location it has, and not finding the file there will report the file missing or offline message. That covers the file missing aspect of the message. The offline aspect is a bit different. Let’s say your image is on an external USB drive that is mounted with a particular drive letter (G: for instance); Lightroom will record the location on the G: drive (say at G:\2011-06-17\photo04.jpg). Later when you run Lightroom without the drive connected, or if it is connected but mounted under a different drive letter, Lightroom will not be able to find the file G:\2011-06-17\photo04.jpg and so the photo is missing. 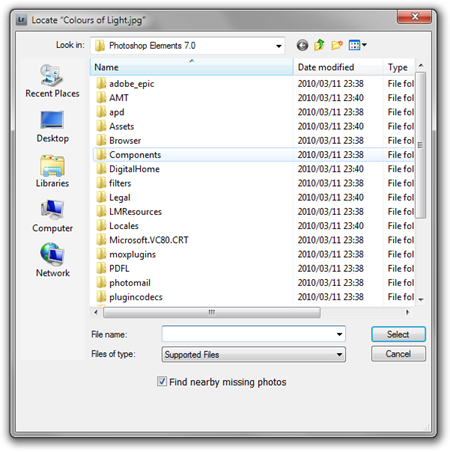 In either case you will still have access to many of Lightroom’s features; the database contains a low-res preview version of the missing images, along with all the metadata, keywords etc. so you will still be able to look for images, add keywords and so forth. No functions that require access to the actual photo file will work though. The way to ‘get images back’ depends on whether the file is missing or offline. If it’s offline because the external drive containing it is not connected, just connect the drive making sure that it gets the same drive letter it had before, and Lightroom will now find the file. If you had moved the file outside of Lightroom you will need to use the locate function to point Lightroom to where the file is now. The image thumbnail will have an icon overlay showing the file is missing. If you click on it you will be shown a message box asking it you want to locate the file. When you click on the Locate button you are shown a standard file open dialog that you can use to select the new location of the file. Unfortunately you need to know where the file is now, but Lightroom does give you a little help. On the confirm dialog the full path the the file, including the name is shown, so we see in the screenshot above that the missing file is called Colours of Light.jpg so if you don’t know where it is now you can at least use a search utility to help you find it. Both Windows and Mac have built-in search utilities but I prefer to use a free third-party Windows utility called Everything for this. I can run Everything and type in all or part of the file name from the Confirm dialog to see where the file might be now. We can see that I moved the file to the folder C:\Users\Steve\Pictures\Moved Files so I simply need to navigate there in the Locate dialog, select the file and Lightroom will once again have full access to the file. If you have not only moved but also renamed the file then you are not going to be able to do this if you don’t remember what the new name is and you may have to resort to deleting the image entry from the Lightroom database, but then you will lose any processing or keywording you’ve done on the file too. It’s better never to have to do this; I know I don’t. But how is this possible? Simple. I never use anything but Lightroom to manage my photos. My advice is this; once you have imported your photos into Lightroom, don’t ever use Windows Explorer, Finder or anything else to manipulate your image files. If you need a copy of the photo at a different size, in a different folder or with a different name; export it from Lightroom so your original file remains untouched. It you want to move your files around, use the Library module in Lightroom to move them. 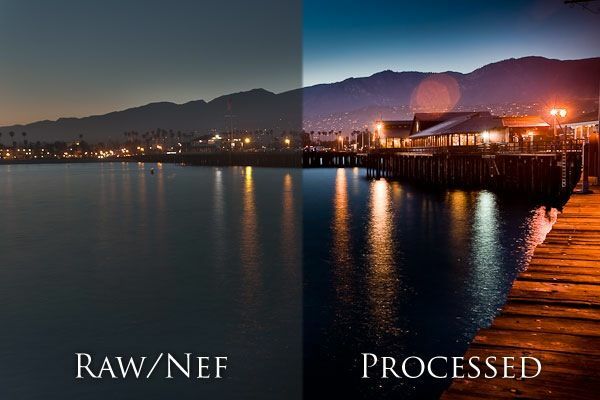 As I’m out on the road teaching I always pick up on areas in Lightroom that people are having a hard time with. One area I realized was saving JPEGs. Why, when, how, and what settings to used are some common questions.